Kolkata recently hit the headlines for experiencing a rapid build-up of smog episodes that according to the Air Quality Index (AQI) of the Central Pollution Control Board (CPCB), was worse even than Delhi. Cities have locked themselves in a difficult race. Particulate matter of less than 2.5 micron (PM2.5)—that go deep inside our lungs—was the most prominent pollutant during this episode and the overall AQI remained largely in the “Very Poor” category, which is more than double the ambient air quality standards. Our deeper look into the matter exposed that during this period, wind speed in this otherwise windy city had dropped significantly. Very calm atmospheric conditions had trapped pollution, leading to a rapid build- up. But the city has yet to come up with an emergency plan to ramp up action during smog episodes. 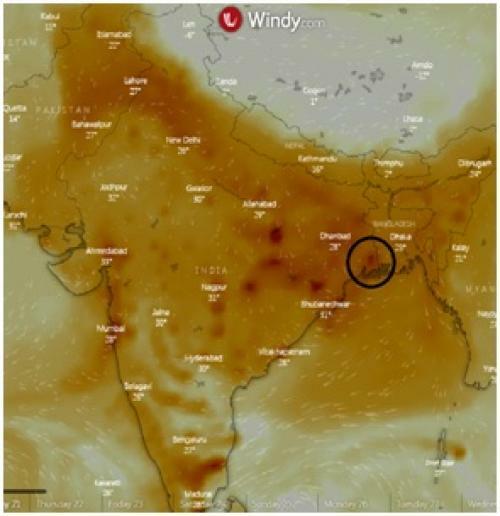 The wind data from the CPCB shows that during the period November 12–18, the 24-hour wind speed ranged from 0.36 kmph to 2.2 kmph at the Rabindra Bharati University station. Overall, the wind speed remained below 1.5 kmph. These are very calm conditions. Since October 15, while Delhi’s pollution levels remained “Very Poor”, occasionally hitting the “Severe” level, on several days, the gap with Kolkata has been narrower. (see Graph: Comparing Delhi and Kolkata AQI from National Air Quality Index). This is only the onset of winter. Air quality is likely to worsen when real winter conditions with lower temperature and lower mixing height of air will set in. This demands strong preventive action. To understand this smog episode so early in winter in Kolkata, we looked deeper and scanned the satellite imagery over the city and the eastern region. This has exposed a very interesting trend in the region. Satellite images show a higher build-up of sulphur dioxide (SO2) mass over Kolkata. This SO2 mass is more widespread and encompasses Dhanbad, Durgapur and the surrounding region (see Map: Satellite image of mass of sulphur dioxide). This indicates the influence of coal burning in power plants and industry. In fact, yet another modelling exercise carried out by the Urban Emissions Info indicates that this particular smog episode in Kolkata has been influenced by power plant emissions and domestic use of solid fuels. But it is interesting that the local ambient SO2 concentration in the city is, however, low. While this phenomenon will require more analysis, we know from other studies and assessments such as that of CPCB in other cities like Kanpur that ambient SO2 levels can be quite deceptive. Most ambient SO2 transform into secondary particulate and form sulphate articulate and add to the ambient particulate concentration. This could be one of reasons behind this sudden increase in PM2.5 concentration in Kolkata. This makes mitigation of secondary particulate very important in our cities and the region. In fact, the 2015 IIT Kanpur study on Delhi’s pollution sources has shown that during winter, secondary particulates that include sulphate and nitrates, can be a quarter of PM2.5 concentration. This means sulphur dioxide and nitrogen oxides that come from the combustion sources including vehicles, industry, power plants etc go through yet more rounds of chemical reaction in the air and form these tiny particles and increase PM2.5 concentration in the air. This, therefore, requires very stringent measures not only to control dust sources but also combustion sources. This is exactly what Beijing has also done to control their severe pollution. Kolkata, like Delhi, and other cities also requires an emergency plan for immediate response during smog episodes to shave off the pollution peak, as well as a comprehensive action plan for more systemic changes for sustained gains round the year. In fact, this winter, Delhi has gone to the extent of shutting down power plants, close industry on biomass and coal, banned diesel generator sets, and stopped construction and trucks. This has reduced number of severely polluted days so far. The Indian Institute of Tropical Meteorology has also indicated that emergency action has also helped in quicker thinning out of smog peaks this winter. Kolkata is also framing similar plans. But its early finalisation and implementation can go a long way to prevent such smog episodes and prevent ill health and early deaths. During smog episodes, people with heart and lung diseases are extremely vulnerable. Early action can prevent health emergencies. We have repeatedly pointed out that Kolkata has a much better opportunity than Delhi and many other cities to control pollution and should leverage that advantage. Kolkata does not have major power plants or big industries inside the city, it has a strong public transport network and substantially high usage of usage public transport, and substantially lower number of vehicles compared to Delhi. Kolkata barely experiences major power cuts; as a result, use of diesel generator sets is much lower in the city. But what is still going wrong is the rapidly rising number of vehicles aggravated further by the daily influx of vehicles from outside the city; very high use of diesel in the transport sector. And there are several area-wide pollution sources including open burning of solid fuels in open eateries, small scale industrial units, construction activities without adequate dust control measures, and use of solid fuels for domestic cooking. All these sources require stringent measures and scaled-up action to avoid a dark winter of ill health.